Last year, I connected with a Paris-based group called the Yogurt in Nutrition Initiative, a collaboration among the Danone Institute International, the American Society for Nutrition, and the International Osteoporosis Foundation. The group's mission is to stimulate research into yogurt's health benefits and to disseminate yogurt-related findings to other researchers and to the public. In a few weeks, I'll be a guest of the Institute at its fourth global summit, which this year centers on yogurt and Type 2 diabetes. The Institute will serve a luncheon to all attendees featuring recipes from Yogurt Culture and a new-to-me book, Ma Table Festive: Yogourt, by Canadian author and registered dietitian Hubert Cormier. Hubert hails from Quebec, so it's no surprise that his cookbook is written entirely in French. (In fact, he's bilingual, and an English version of his book will be published in 2017.) Happily, I studied French for many years, so when he and I exchanged books in advance of our upcoming meeting, I had fun working my way through his colorful, health-forward recipes. I think what I most appreciate about Hubert's recipes is how different they are from my own. 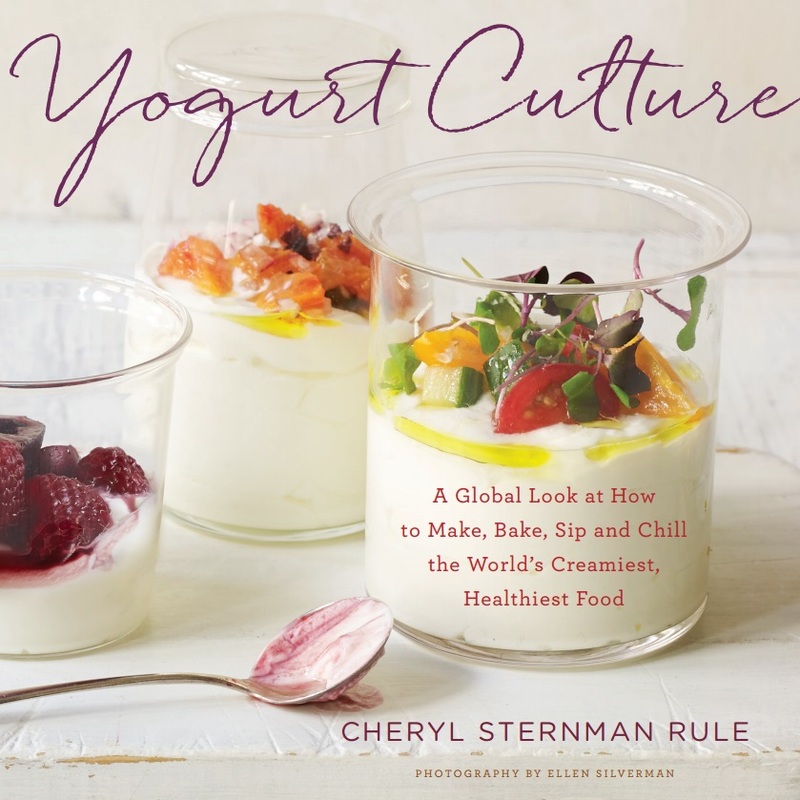 While I focus largely on yogurt as a food of global significance and build dishes rooted in world flavors, Hubert highlights yogurt's fresh and natural appeal, showcasing the ingredient's playful versatility to great effect. Case in point: these smoothie cubes layering puréed, frozen fruit with plain or vanilla Greek yogurt. In the book, he features a jar of the petite cubes in riotous colors. Some are striped orange (featuring mango), others red (raspberry), and still others bright green (think of a frozen layer of green smoothie). The cubes are totally customizable, so you can mix-and-match flavors and colors, keeping each variety separate, or go the lazy route by mixing them all together and creating a single blended hue as I've done in the photo above. It's one of many great ideas you'll find in Ma Table Festive. In his head note, Hubert notes that these cubes provide a convenient way to make smoothies ahead of time and avoid waking your entire family with a noisy blender come morning. (The idea is to freeze the cubes, transfer to a zip-top bag, and pluck out the ones you'd like for breakfast, defrosting a handful of cubes in a glass in the fridge overnight.) I take a different tack: I enjoy them as a midday nibble, allowing a single cube to defrost just enough for me to eat it with a spoon. I also used a much larger silicone mold, so a single jumbo cube made a nice snack. Either way, kids will love these. Adapted from Hubert Cormier's Ma Table Festive: Yogourt. Divide the yogurt among 6 "cubes" of a jumbo silicone ice cube tray, and smooth the top. The yogurt should fill the cubes roughly halfway. Smooth lightly. Freeze for one hour. Divide the pureed mixture among the silicone cubes, smoothing lightly atop the now-frozen yogurt. Return to the freezer. Freeze several hours, or until firm. Transfer to a freezer-safe bag. Enjoy one at a time as a snack, or defrost a cube or two overnight in the fridge in a glass to enjoy a super-fast, fuss-free smoothie in the morning.